MS Fram is the first of the Norwegian cruise ships that’s especially designed for cruising arctic waters. From June 2008 MS Nordnorge will be replaced by the MS Fram. Enjoy my Nov-Dec, 2004 vacation on the Nordnorge. Antarctica : Once the continent of only the wealthiest adventurers, it is becoming accessible to more and more travelers. Nearly all of these travelers make the journey on a passenger vessel. The cruise industry competition is clearly behind the boom that is bringing on line more and larger ships. slicing the minimum cost of a voyage to the White Continent nearly in half. To cater to this booming industry, the Nordnorge : a Norwegian cruiseship, designed for the Norwegian fjords, has joined the Antarctic waters, until it got replaced by the in 2007 built Ms Fram (which cruises Greenland and the Arctic waters in the Northern Hemisphere summer (juli) and the South Pole in Southern Hemisphere summer (december. More than 15,000 people joined holiday cruises to Antarctica onboard a record 25 motor vessels and four large charter yachts during the austral summer of 2003-2004. Perhaps as many as 5,000 more passed along the fringes of the Antarctic Peninsula onboard larger cruise ships such as Holland America Line’s Amsterdam, Princess Cruises’ Royal Princess and even The World of ResidenSea – the privately owned residential cruise liner. Although these visits are sightseeing-only, without actual landings, such voyages are likely to inspire some passengers to book more comprehensive voyages in the future. 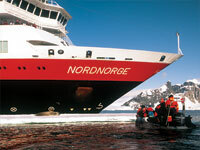 The Norwegian vessel, Nordnorge, which made her Antarctica cruise debut during the 2002-2003 season, serves as a good example of this larger-vessel/lower-cost trend. One of the more recent (1997-built) of the dozen ice rated vessels of the Norwegian Coastal Voyage fleet (now called Hurtigruten). The 11,386-gross-register-ton/404-foot Nordnorge has 464 berths but accepts a maximum of 350 passengers for her 19-day "Antarctica & Chilean Fjords" program with eight departures (Buenos Aires to Santiago and reverse) between mid-November and early February. A ninth sailing has been added for 2004-2005. departing from Buenos Aires on February 23, and visiting the Falkland Islands. South Georgia, and Antarctica. Carrying a fairly even mix of European and North American passengers, the Nordnorge was booked almost to capacity during her second Antarctic season. This comes as no surprise in view of the operator NCV’s extremely attractive per-person fares, ranging for the 2004-2005 season from $4,445 to $7,445, including airfare from New York and pre- and post-cruise hotel stays. Rates for the 21-day February 23 voyage that includes the Falklands and South Georgia ranged from $5,010 to $7,965. My trip began with a LAN-Chile flight from New York to Buenos Aires. Here guests overnight at the Sheraton with the opportunity to join optional programs including a city tour, a tango show and dinner (highly recommended) at the elegant Esquina Carlos Gardel. Passengers to Antarctica are transferred by charter flights the following morning to Ushuaia, Argentina. Here travelers get an orientation tour of the world’s southern most city and an optional visit to nearby Tierra del Fuego National Park before boarding the Nordnorge. 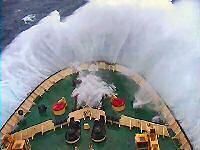 What you will most remember on board of your cruise ship is… the crossing of the notorious Drake Passage. Consider it an initiation ceremony for all souls bound for Antarctica. The size and heft of the Nordnorge is a distinct advantage, providing relative comfort in the roughest of seas, which we thankfully didn’t have to endure on our Drake Passage crossing. There are actually several other ships larger than the Nordnorge operating expeditions to Antarctica, including the Discovery (ex Island Princess), Saga Rose, and Marco Polo. But the Nordnorge is clearly the best suited for the task among these big ships. Designed for year-round service in Norway’s narrow fjords and often-icy polar waters, she features powerful bow and stern thrusters for amazing mobility. Do know: it is not a real icebreaker. Plus there’s a cargo deck just above the waterline that adapts nicely for use as a changing area and loading ramp for the Antarctica ship’s fleet of Polar-Cirkel boats. There’s room on this deck as well for protected storage of these inflatable craft, which are similar to Zodiacs. Interior decor and cabin layout is comparable to most modern mid-range cruise liners, featuring lots of brass, glass, and rich veneers. Lounges, bars, the cafeteria, dining room, and other public spaces are comfortable and spacious, obviously designed to accommodate the large number of day passengers who frequent the Norwegian coastal service. Cabins are a bit snug compared to most newer cruise ships, but generous next to those of the typical expedition vessel. There is a pair of master suites and a dozen junior suites that offer queen-size beds, TVs, and a fridge: not to mention the added space. Breakfast and lunch are served smorgasbord-style from a bountiful buffet while dinner on this Antarctica cruise is a sit-down affair with two seatings. Food is tasty and plentiful, although a few passengers complained about the limited choice of entrees (two) at dinner. The wine list is a good one with a number of agreeable selections under $20 a bottle. The cafeteria serves as a round-the-clock source of coffee, tea, and flight snacks. In keeping with the tradition of Antarctica expedition cruising, lectures are center-stage in terms of entertainment. In fact, the Nordnorge Antarctica Ship has no showroom, no casino, nor a wimming pool. There’s a no-frills gym and sauna, a small library, and a shop stocked with extreme cold travel essentials and souvenirs, but that’s about it for this ships’ amenities. The vessel does receive satellite television, both in the suites and at wall-mounted sets in the cafeteria. Passengers seemed keen on following world events, though we eventually lost the signal some where about 62 degrees south. Most likely no coincidence that beyond that point, we were surrounded by icebergs, whales, seals, and penguins, so nobody missed the TV. Once you are able to enjoy the wildlife up and close, you better enjoy it to the fullest! along the incredibly scenic Neumayer and Lemaire channels to the mid-peninsula region. Norwegian Captain Kjell Skjoldvaer had his sights set on commanding the first Norwegian-flagged passenger vessel to cross the Antarctic Circle. This early-season (mid-December) attempt would be thwarted, however, by pack ice in the Grandidier Channel that simply made the going too slow to allow the Nordnorge to stay on schedule. We did come within about 70 miles of the circle : a record achievement at the time for a Norwegian passenger ship. a visit to volcanic Deception Island where the more adventurous among us enjoyed a dip in the "warm waters" of the island’s caldera, which rims Pendulum Cove. Having visited Antarctica previously on a much smaller ship, I was concerned at first that the process of shuttling 265 visitors ashore via the eight-passenger Polar Cirkel boats would be tedious and that time ashore would be too limited. Such was not the case in this Antarctica cruise however, thanks to the well-organized efforts of Tomas Holik, an Argentine ecologist and veteran Antarctica expedition boss. We always had a minimum of an hour ashore. In frigid conditions this proved more than enough for the majority of the passengers. The Nordnorge usually calls at the Henryk Arctowski Antarctica Station. This is an visitor-friendly base operated by the Polish Academy of Sciences that features a particularly stylish and informative information center about the continent. Ice and poor weather in Admiralty Bay resulted in a visit instead to Vernadsky, formerly Britain’s Faraday Station. Here scientists years ago began raising concern about the "Ozone Hole" above Antarctica. Ukrainian researchers continue to monitor the ever-expanding ozone hole and happily share their up-to-the-minute findings with visitors. There’s a post office at Vernadsky that will frank your cards and letters for delivery in roughly six weeks and a bar that offers lady guests drinks in exchange for their brassieres, a number of which dangle proudly from the ceiling. More than icebergs and research stations, it is penguins that people come to see. At Cuverville Island and Neko Harbour we were virtually overwhelmed by thousands of entertaining gentoo penguins. Although not as large and colourful as emperors or kings, the gentoo is the largest of the brush-tail species. They are quite active and amusing as they interact in rookeries that number into the thousands of birds. Port Lockroy provides a history lesson on an otherwise nature oriented holiday. Built by the British in 1944 as "Base A" of Operation Tabarin, this was a wartime intelligence post aimed at tracking German U-Boats in the Southern Ocean. After the war it was put to use as a research station and operated as such until 1962. Rather than abandon the base and allow it to fall into disrepair (as too often happens), the British Heritage Trust rescued Port Lockroy and has restored the base as a museum and became as such the most visited site of the continent. Ring-shaped Deception Island was our final shore call and was, perhaps, the most fascinating of all Antarctic scenes, as we sailed into the island’s huge internal crater, altered as recently as 1970 by volcanic eruptions. A few hardy bathers took a dip in the frigid waters and then wallowed in warm springs that line the beach of black volcanic sand. Others investigated the ruins of 19th century whaling stations and a more recent British base where the remains of an aircraft hangar and the battered fuselage of an RAF de Haviland Otter testify to the destructive force of a mud flow caused by a 1969 eruption. Five full days of sailing went by like a flash but not without some last minute fanfare. First came a visit by a pod of five humpback whales that courted the Nordnorge for more than 30 minutes, showing off for the cameras with such stunts as "flippering" and "spy-hopping"
It was quite a show and soon followed by the sighting of a gigantic tabular iceberg. 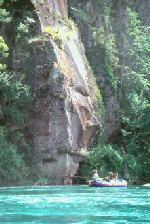 One would have thought it was an island : several kilometers square and taller than our ship. Captain Skjoldvaer manoeuvred us right up next to the berg then cruised around it to illustrate its size. We came to learn from lecturer Alan Parker, an Aussie naturalist who has done Antarctica cruises some 55 times, that there are a number of much bigger bergs than the one we investigated. Some, in fact, are larger than the slate of Rhode Island, and their movements are tracked by satellite. 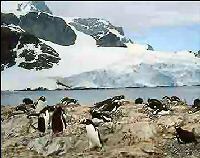 Most of the longer cruises include stops in the Falkland Islands and South Georgia Island en route to or from the peninsula. NCV has chosen to combine eight of its nine cruises with a weeklong voyage through the islands and fjords of southeastern Chile. On my voyage the Chilean odyssey began with the good fortune of being able to land at Cape Horn : this following another blessedly smooth crossing of the Drake Passage. Although rather barren and wind-blown, Cape Horn was an awesome, almost mystical place. Many of us hiked out to a memorial to lost seamen: a striking sculpture in the shape of a seabird, overlooking the dreaded Drake. Puerto Montt, a busy port city that serves as a gateway to Chile’s spectacular Lake Country. Many of the passengers joined an optional tour here, visiting the resort town of Puerto Varas on Lake Llanquihue and Vincente Perez Resales National Park. There the voyage took in the scenic splendour of Petrohue Waterfalls and emerald green Lago Todos Los Santos (All Saints Lake), with snow-covered Orsono and Calbuco volcanoes in the background. A short flight from Puerto Montt to Chile’s capital city of Santiago positions NCV passengers for return flights home following a restful night at either the Marriott or Hyatt Regency hotels. Alternate voyages that begin in Santiago follow a very similar reverse itinerary. It would appear that Norwegian Coastal Voyage Inc. has come up with a winner, matching one of its nifty Norwegian/Nordic cruise liners to a new itinerary. These southern hemisphere voyages seems to suit her perfectly: a happy coincidence that has resulted in the best value available today on an Antarctica cruise, plus Chile to boot!